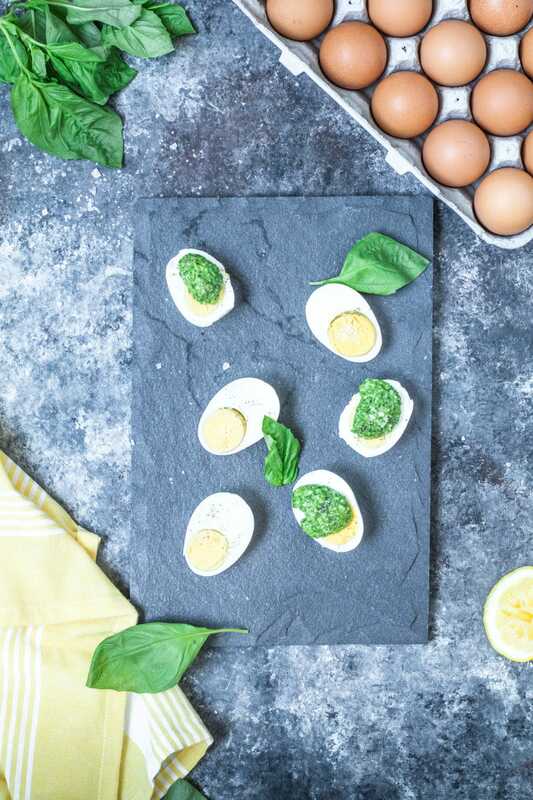 Parmesan Pesto alone is delicious…but paired with hard boiled eggs just takes things up a notch! Perfect for Easter, or any Spring occasion! This versatile pesto is so delicious and has such a wonderful flavor. You can serve it over boiled eggs like I did in this recipe, or toss with some pasta, zucchini noodles, or even spaghetti squash. With Easter right around the corner, this could be a perfect addition for a family brunch. Something new for the kids to venture out and try…and something the adults will drool over! I like these because they are packed with protein and vitamins. The pesto is loaded with fresh herbs and spinach as well for an extra boost of nutrition. The process is quite simple as well. The most time consuming part is boiling the eggs! 🙂 I hope you get around to making this pesto because it is to.die.for!! Trust me, it’s even #boyfriendapproved. 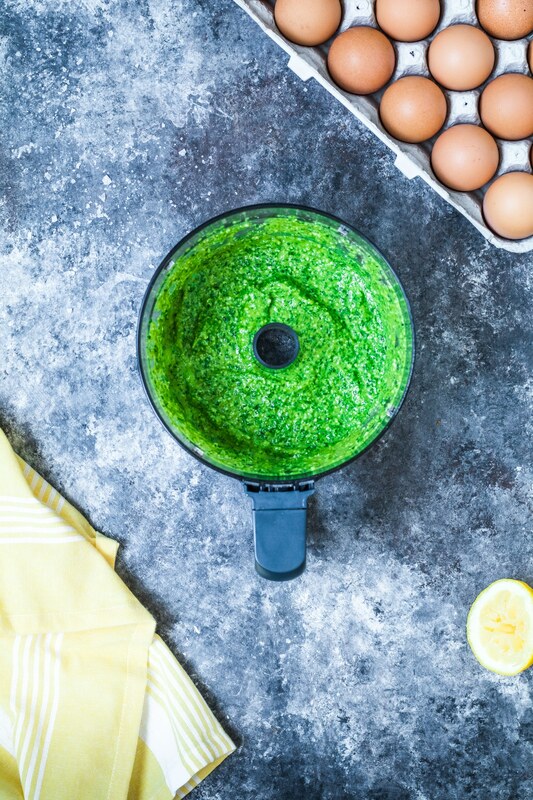 The pesto is super easy to make – just whip out the food processor and blend baby blend. Nut free, high in iron, and rich in flavor. If you have leftover pesto in comparison to how many eggs you have boiled, I recommend tossing it in some pasta with chicken, or top in on salmon! If you’ve struggled with making hard boiled eggs, check out this post! I wrote all about how to make the perfect hard boiled eggs every time! Eggs have 6-7g of high-quality protein per egg. I LOVE how eggs can be included in a protein packed snack/breakfast/appetizer/ANY meal to help us sustain mental and physical energy. Don’t be afraid of the yolks: Egg yolk contain choline which promotes normal cell activity, liver function and plays a key role in the development of infant’s memory functions. 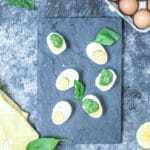 Pesto with eggs is a flavor combo you won't regret trying!! Process all ingredients in a food processor or blender until smooth. Scrape down sides as needed. Once blended place a dollop over boiled egg halves an sprinkle with any leftover parmesan and a pinch of pepper. Thank you! Give it a try they were SOO yummy! I love pesto mixed in scrambled eggs— so I know this recipe is a winner too! Thank you! 🙂 Soo yummy!